This work almost certainly represents the same landscape depicted in The Colliers' Hut, painted around 1855. We find the same hut hidden near a wood, with tall trees on each side, the small one leaning to the right. While the location of the scene depicted in the painting leaves no room for doubt, the same cannot be said about the dating, since Rousseau often experimented with different styles and techniques. In his search for an inaccessible absolute, he felt perpetually tormented. 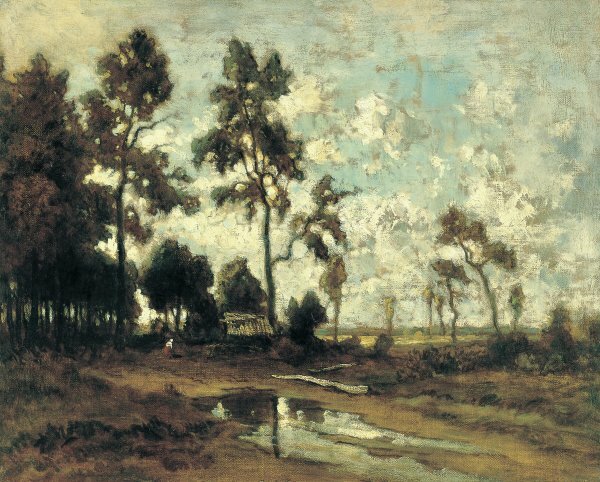 For this reason he painted works of different types, from finished landscapes where the vegetation is perfectly rendered, to the more sketched works, which are perhaps less characteristic, but closer to impressionism, or at least to his intimate feelings. This is the case of the painting we are dealing with, where detail gives way to the general, where the volumes and the light play a more important role, if not the leading part. What strikes us here is his use of browns and of sections of the canvas left blank. It has probably been raining; evidence of it seems to be the puddle in the foreground, with its splashes of white. The atmosphere has become peaceful once more, and the human activities are taken up again. Thus, the woman in the white shirt walks towards the colliers' hut. Often Rousseau began a painting by first working on a drawing. Colour was then only a question of visual observation and organisation, as his friend Sensier once said. But in this painting, we feel that Rousseau sketched the landscape, thought it out and directly represented it on the canvas. It is on these occasions that he often reached the sublime: when the sketch disappears behind the painting, though remaining joined in the genius and sensitivity of the artist.